We often talk about the importance of well-maintained, excellently-designed, effective handguns. BUT don't forget that the holster is probably your second most important piece of kit. It, too, needs to be well thought-out, well-designed, and allows you to draw the firearm quickly, safely, and put shots quickly on target. 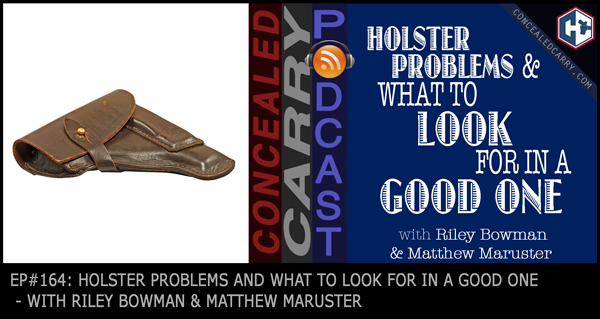 Today's episode tackles some of the problems we often see in holsters and what can be done to make them better and also what you should look for to pick the best quality holster for you and your needs. Press ‘PLAY' to listen now! Quick Draw. Quick Draw is designed specifically for holsters and works wonders on holsters of all types. Use it to clean, condition and lightly lubricate your holsters so they perform at their best when you need them to! Why talk about a subject w/o showing anything. Hi Bill, thanks for listening! We talk twice per week on the Concealed Carry Podcast without showing anything. It’s just a different medium from written articles and videos to communicate with people. Many thousands of listeners to the podcast enjoy listening because they are able to learn and educate themselves about concealed carry related topics at times when reading or viewing would be difficult or otherwise impossible. Oftentimes this may be while driving, working or commuting to/from work similar to a talk radio show. We have much other great content throughout this site that contains images and short videos as well. I live in a rural area and rely on satellite for internet access. It is extremely expensive so I can rarely watch podcasts, etc. Do you provide text transcripts? Thnx! I’m sorry, but currently we do not publish transcripts. It is too expensive to do at the present time. At a minimum it would cost us a few hundred dollars per week. The best thing to recommend would be for you to do your best to LISTEN to the podcast episodes. They are audio only and are not that large of files to download.